Rat Fink, the brainchild of Ed “Big Daddy” Roth, was born in the midst of what is known as Kustom Kulture. This encompasses the cars, artwork, fashion and lifestyle of the American custom car and motorcycle culture. Loosely based on a mouse or rat, Rat Fink is a crazed-looking creature with green or blue skin and bulging eyes. His huge mouth, with lots of sharp, yellow teeth, is in a perpetual snarl or insane-looking smile. He also wears a T-shirt with the letters R.F. emblazoned across the front. Ed “Big Daddy” Roth, the artist, took this character and placed him in the driver’s seat of all different kinds of hot rods. These are the drawings that made Roth and Rat Fink famous. Roth made t-shirts and took his creations to fairs, car shows, and drag events. 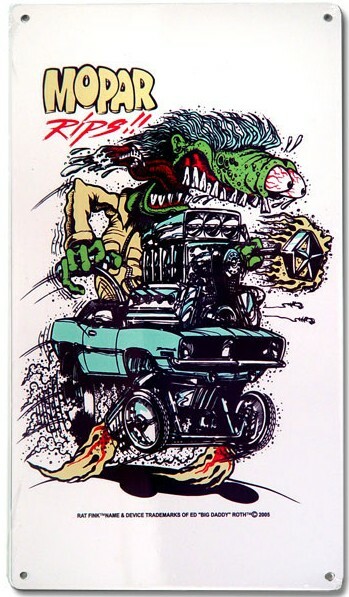 The popularity of the Rat Fink drawings grew, and so did the reputation of Ed Roth. The sales of the Rat Fink merchandise financially allowed Roth to concentrate on his own custom car building business. Roth had been building cars in his garage, and was one of the early designers to use fiberglass as a material for vehicles. For this reason, Ed “Big Daddy” Roth is highly regarded as a designer and builder of custom cars. In the early 1960s, Revell American began to sell model car kits based on the cars Roth designed, and they also produced model kits for the gang of monsters he created. Millions of the models were sold across the country and merchandise began to expand into different areas. Records featuring songs and stories of the Rat Fink gang of monsters were released. Soon, there were other artists helping Roth keep up with the demand, such as Steve Fiorilla and R.K. Sloane, the artist for Rat Fink Comix, a comic book based on the Rat Fink gang. Rat Fink became a symbol for Kustom Kulture, and will always be known as such. Although Ed “Big Daddy” Roth has passed away, his art lives on. It is in museums, tattoo parlors, and on clothes. One can still buy t-shirts and merchandise featuring the crazed monster, and the art of Roth will always be a part of American history.